[vc_row][vc_column][vc_column_text]When we sip on that delicious latte or filter brew, it’s easy to forget that our favorite drink comes from a plant. Yet millions of coffee trees grow around the world, their fruit powering us through the day. But what does a coffee plant actually look like? How many varieties are there? And how do the flowers and cherries affect the drink we consume every day? Young coffee seedlings still in bags at Finca San Jerónimo, Guatemala. What country comes when you hear the word “coffee:” Colombia, Brazil, Indonesia? Actually, the coffee plant originated in Ethiopia. Over the centuries, coffee spread throughout Africa and the Middle East and from there across the globe. There are dozens of stories about how this happened, from saints sneaking beans out of Yemen to European powers replanting it throughout their colonies. What seems to be undeniable is that empires had a significant role to play. Fast-forward to today. 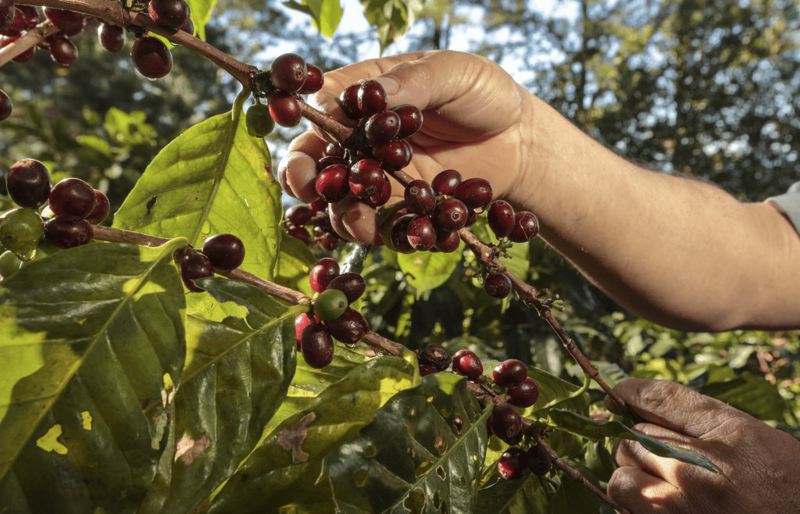 Coffee is an integral part of crop economies in parts of Africa, Asia, and Latin America. Non-producing countries also thrive on coffee, roasting and consuming vast quantities every single day. But what actually is this drink? What is it made of? Coffee seedlings at Finca San Jerónimo, Guatemala. What Does The Coffee Plant Look Like? The name “coffee bean” is a lie: coffee is a seed. You’ll find two (normally) of these seeds inside each cherry-like fruit of the coffee plant. The coffee plant could also be categorized as a tree since it has the ability to grow up to about 9 meters. But on coffee farms, it tends to be cut short to make it easier to harvest. As a result, it often looks more like a bush. 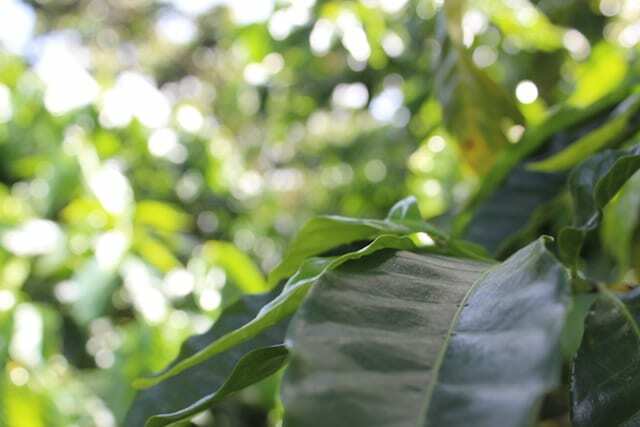 From the main trunk of the coffee plant, you’ll see primary, secondary, and tertiary horizontal branches. From these, dark green, waxy leaves grow in pairs. 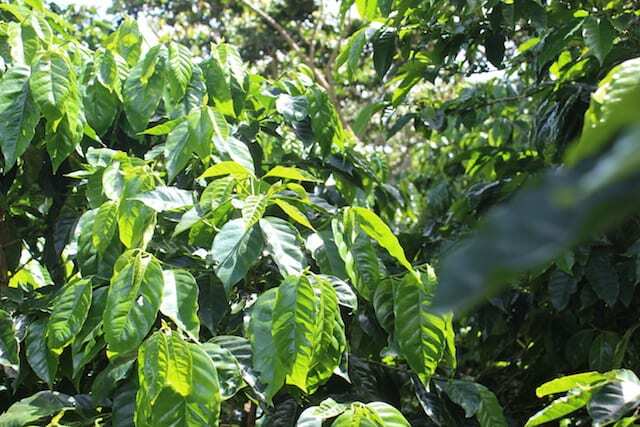 Ricardo Alvarez, an agronomist at Finca Los Tres Potros in El Salvador, tells me, “The leaf is fundamental for the plant since that is where photosynthesis happens.” In other words, no leaves would mean no energy. And without energy, the plants would never be able to grow the delicious cherries that contain our coffee beans. Once the coffee plant is about three or four years old, it will flower for the first time. Small, delicate, white flowers will grow where the leaves and branches join, releasing a sweet aroma. 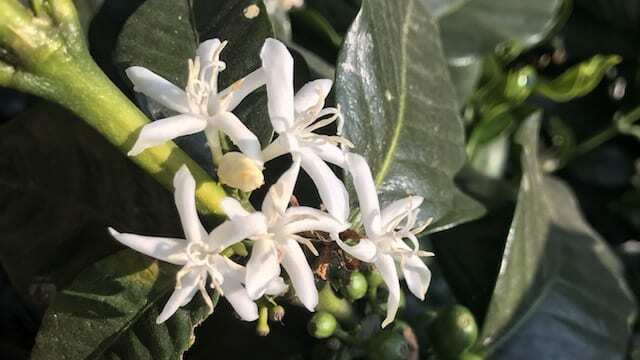 Alvarez tells me, “The flowers are where the sexual organs are located.” In other words, the leaves and flowers help the coffee plant reproduce and sustain itself. Coffee plants flower in a far in Honduras. Six to eight weeks after pollination, a cherry-like fruit will appear where the flowers were located. The unripe cherries are green; over time, they turn red, yellow, orange, or even pink, depending on the variety. And as they ripen, they will grow increasingly sweeter. Within the cherry, you’ll find multiple layers. 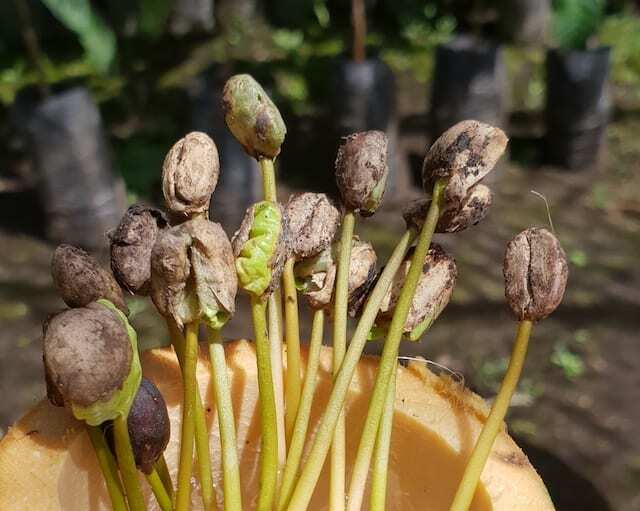 Alvarez says that it has “an exocarp, which is the actual cherry, then we have a mesocarp which is where the mucilage is.” And within the mucilage lies the seeds we can’t face Monday morning without – coffee beans! Inside every cherry, you’ll find two small seeds – unless it’s a peaberry or otherwise defective, of course. A peaberry is when the seeds are joined: instead of two almost peanut-like ones, you’ll have a larger, rounder, pea-shaped one. This happens to around 5% of seeds. These seeds are the coffee beans. They go through extensive processing to remove the fruit and mucilage, before being dried, roasted, ground, and finally turned into our favourite beverage. 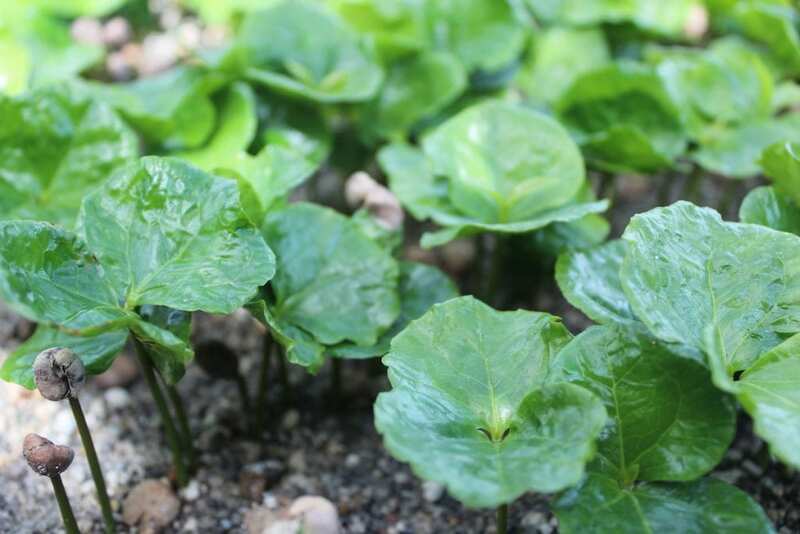 Healthy coffee seedlings ready for grafting, a process that helps make coffee plants stronger. Coffee has over a hundred different species, and each species can be further divided into varieties. And all of these have an impact on how the coffee tastes, how much caffeine it has, and how it grows. Healthy coffee plants at Finca San Jerónimo, Guatemala. Unlike species, we consume numerous coffee varieties. Next time you buy a bag of specialty coffee, look at the label: it may tell you which one you’re drinking. Some of the most common ones include Typica, Bourbon, and Caturra. And then there’s Gesha/Geisha, which is probably the most famous variety of all. This exquisite coffee is known for its delicate floral flavors and aromas, along with a tea-like body. The green beans have also been sold for as much as US $803/lb. The coffee industry also sometimes creates hybrid varieties. As Pedrotti says, these are created when the industry “sees the necessity, or the market, for fusing coffees together.” And the aim? Disease resistance, higher productivity, and better flavour. Pedrotti tells me that a coffee plant could live for up to 80 years. But on a commercial farm? Alvarez says that you might expect them to last for 20 to 30 years, depending on how they’re cared for. For the first few years of a tree’s life, you shouldn’t expect great productivity. Remember, it won’t flower until it’s three or four years old. All coffee trees started life as those very same seeds that we roast and brew every day. As it grows, you’ll see its distinctive shoots and bright green leaves. 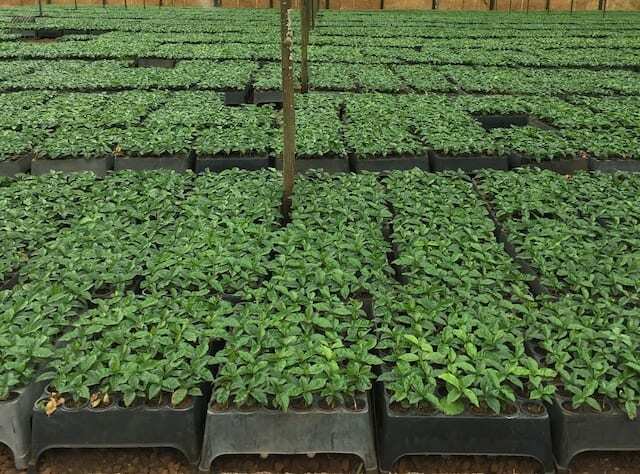 Most producers keep young coffee trees in nurseries until the seedlings are ready to be planted on the farm. Once a coffee plant is mature, it will produce flowers; this normally happens shortly after heavy rainfall. And then, after the flowers, comes the cherries. In some countries, such as Colombia, the climate means that the trees flower twice a year – something that, in turn, leads to two harvests a year. Arturo Aguirre of Finca El Injerto, Guatemala tells me that the producer and farm staff must learn to identify when coffee is ready for harvesting. A coffee nursery at Fazenda Bela Epica, Brazil. The coffee plant, with its bright cherries and delicate white flowers, is a beautiful sight. Perhaps it’s a strong low-altitude variety or a delicate but flavorsome high-altitude one, a young seedling or an old giant, full of ripe fruit or simply dark green leaves. Either way, it’s thanks to this tree that we can enjoy our daily brew and millions of people around the world have a living.